The author of over 350 books, Isaac Asimov is the undisputed dean of popular science. In this, his 23rd published collection of esays, the good doctor transports the reader through an awesome universe of discovery that stretches fromt he Earth’s core to the farthest reaches of outer space. 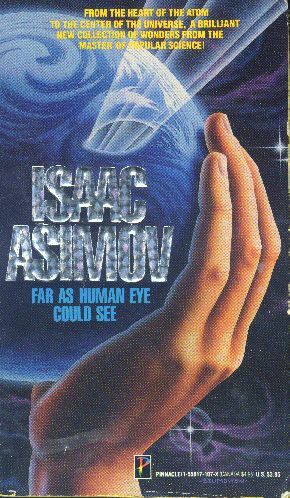 Exploring the magic of magnetism and electricity, unlocking the mysteries of the blood and the secrets of the stars, FAR AS HUMAN EYE COULD SEE is a captivating scientific smorgasbord—enlightening, entertaining, and sparkling with the wit, charm and intelligence that is uniquely Asimov’s. A rare delight for all, from the uninitiated novice to the serious student…and anyone who falls in between. Another F&SF essay collection which has nothing bad about it, but little outstanding. It also contains one essay, “Superstar,” which was obsoleted almost the instant it saw publication, which is a shame and detracts somewhat from the entire collection. Still, this is worth having and a sine qua non for any true Asimov nonfiction fan, if not quite as fantastic as some of the other collections.